My first attempt at doing my own laundry was freshman year at college. My Mother gave me specific instructions and sent me off with her favorite brand of laundry soap. On my breaks from college I did not go near the washing machine. I did however hang the laundry up outside on the clothes line and hang up my Dad's dress shirts fresh from the dryer. In my house I always did the laundry, not my kids or husband. You know it's the mom's job and so on. There was a time I was unable to do the laundry do to surgery and my youngest took it upon herself to wash her own clothing. How nice was that. She still does her own laundry. When my oldest is home from college she arrives with a pile of dirty duds and bedding to wash. The rest of the house laundry is on hold for days and days. Those machines are running all day. One daughter asked if she could have her own washer and dryer in her room. Sure I say!!! Or better yet, we could install commercial machines. right. As far as what detergent to use in these machines I've tried several major brands. Some I like, some I don't buy again. I like Purex brand detergents. Reasonable priced, available at major department stores and drug stores. Nice fragrance, works well, coupons available. 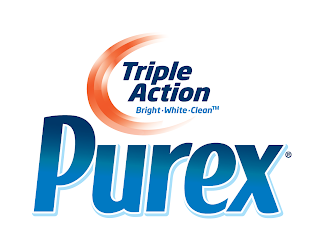 Purex® has a new laundry detergent out called Triple Action Purex. I tried the Mountain Breeze fragrance. Smells nice, works well. It is safe for all machines. I have seen some detergent brands have a higher price for HE formulas and less load washes per bottle than regular formulas. This is both, same price, same wash loads, same for regular machines same for HE machines. Works for me. Look for Purex® Triple Action laundry detergent where you buy you washing machine suds. giveaway: Leave a comment on this post for your chance to win one of three coupons from Purex to get your own Purex Triple Action. closes on December 31, 2011 at midnight. Hey you might even be awake then! Disclosure: I was given a bottle of Purex® Triple Action to try, the views,comments and clean clothes are my own. I'd love to try it! Thanks! I'd love to try it!! Considering doing laundry at my house is practically a full time job, I'd love to win this! Thanks!! This would be good to try. I have little kids that make dirty clothes. 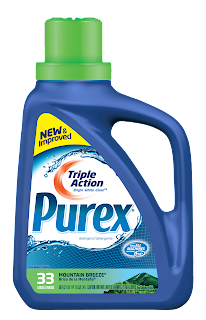 I love Purex and my family would really love to have a free bottle! eksing at gci dot net. I am told the coupons are on the way! I would love to try the new Purex! Thanks for the chance! I am told coupons are on their way! Hi Alison thanks for the heads up. I didn't know Purex makes a HE detergent! Will be looking for it at the market! Purex Triple Action sounds like the next best thing for doing laundry ヅ *Thanks* for the giveaway! I love Purex!! Would love to win! Congratulations to Life in my land, AnnMarie, and Elisabeth! You each one a free bottle of new Purex. 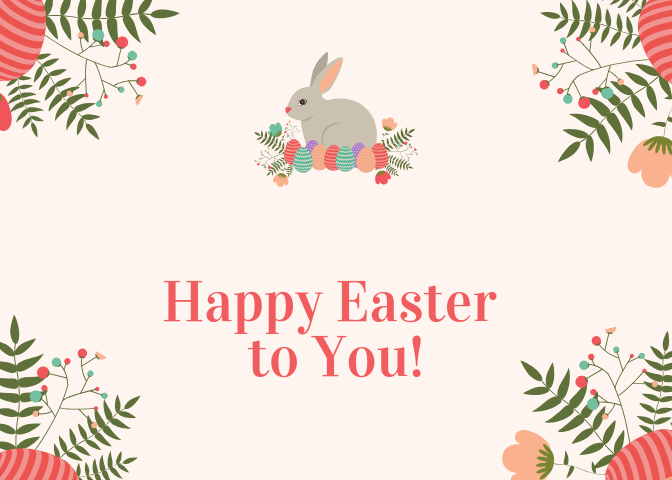 Look for an email from me.Congratulations and thank you to everyone for reading and commenting! Another Purex giveaway is in the works! cool new way to do your laundry.